Scott Hallett | Sketchbook: Classic Video Games! The topic this week at Drawer Geeks was "Classic Video Games", or anything that came out before 1985. I actually did 3 pictures for this one (one isn't scanned, and I'm not too happy with it). There was a big break over the holidays so I sort of chipped away at it here and there. 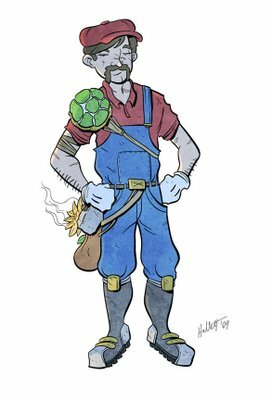 I have always been a big video game fan, ever since I first played Super Mario Bros. on display at a K-Mart when it first came out. First up is a re-design for Mario from Super Mario Bros. Sort of a grounded in reality, practical design. Not 100% sold on this one, but a good learning experience. Next is just sort of an homage to the NES in general. 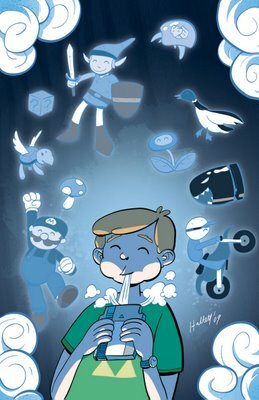 I wanted to put a positive spin on the act of blowing dust out of the NES cartridges every kid who had one is probably more than familiar with.